Seit 2007 organisieren die Jungen Geomorphologen jährliche Treffen an wechselnden Veranstaltungsorten in Deutschland. Die Präsentation der Forschungsarbeiten der Teilnehmer in Vorträgen und Postern, sowie Keynotevorträge und Workshops gehören zu den wichtigsten Bestandteilen dieser Treffen. Zudem bieten wir jedes Jahr eine halbtägige Exkursion an und reservieren ausreichend Zeit für informelle und offene Diskussionen. Seit einigen Jahren bemühen wir uns den Kontakt zu internationalen Gruppen junger Geomorphologen zu intensivieren und haben 2014 unser erstes internationales Treffen erfolgreich ausgerichtet. 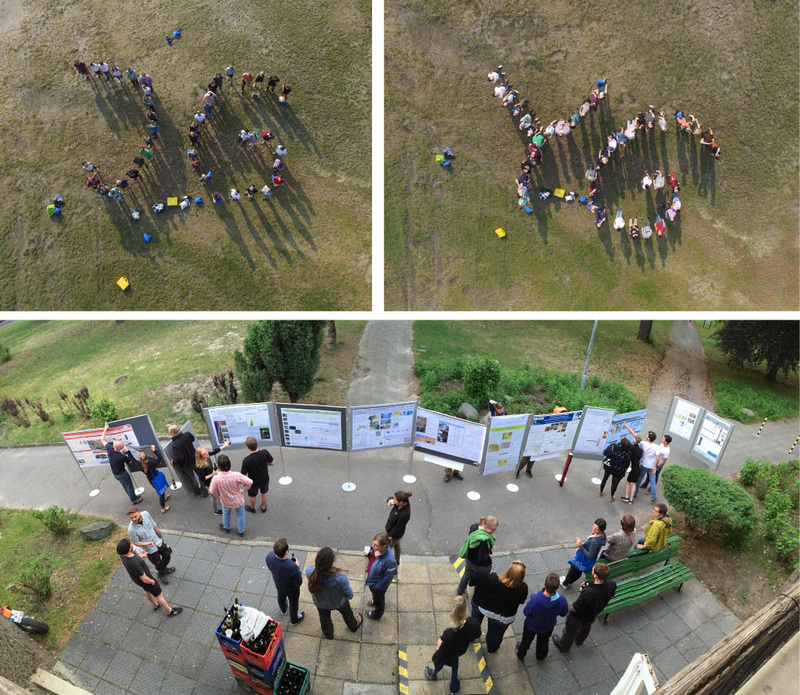 The German Young Geomorphologists (YG) conducted the 12th International Young Geomorphologists’ meeting in Stadtoldendorf from May 25-27, 2018. 49 German and international guests from Austria, Italy, Slovakia, India and Switzerland gathered close to Hildesheim for a three-day meeting. The list of attendees comprised undergraduate, graduate and PhD students as well as postdocs from 20 different universities and institutions. The focus was to present and discuss own research and general geomorphological topics in a rather informal and friendly environment. The program started with the usual introductory games where the participants shortly introduced themselves and their research projects (“Scales Game”). The attendees could continue the get to know each other during dinner. This was followed by an “After Dinner Talk” with Prof. Dr. Andreas Lang (University of Salzburg) “On formative events, conserving topography and morphologic hysteresis – a geomorphological trajectory”. The talk was followed by a very lively discussion on careers in geomorphology and academia in general. Afterwards, the persons responsible for the individual posters were asked to advertise their work with one slide in a limited time of 30 seconds (for further details on the broad selection of topics see program in the attachment). This was followed by the actual poster session, which was open ended, so that discussion kept on going far into the night. Saturday began with the second keynote presentation by Dr. Peter Fischer (University of Mainz) entitled “Terrestrial System Response to North Atlantic Climate Oscillations during the Last Glacial Period a new high- resolution Loess-Palaeosol-Sequence from the Schwalbenberg (Middle Rhine Valley, Germany)”. The keynote lecture was followed by the first session of oral presentations on “Paleoenvironmental Research”. Afterwards, the organizing team of the German YG gave a short overview of their activities in the past year and upcoming events (e.g. YG session at EGU, social events at conferences, YG meeting 2019 in Gießen). The YG introduced funding possibilities and awards from the AK Geomorphologie that are available to the YG members of the AK. Furthermore, we put our focus on the upcoming joint AK Geomorphologie and DEUQUA conference, the “Central European Conference on Geomorphology and Quaternary Sciences”, in Gießen and the election that will take place during the conference. 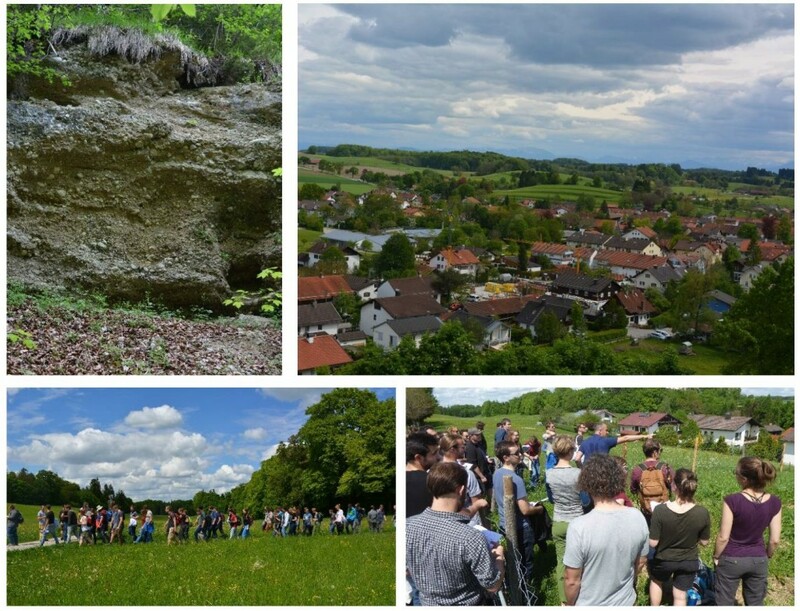 After lunch, Jun.-Prof. Dr. André Kirchner (University of Hildesheim) led an excursion to the sourroundings of Stadtoldendorf, where the participants could observe geomorphological features of the area (dolines, loess deposits and soil profiles, etc.). The first stop of the excursion was a close by surface mine (see pictures below), where anhydrite and gypsum are excavated and the regional geologic and geomorphological setting was elaborately introduced and explained. At the following stops soil profiles and sinkholes were shown, explained and discussed. Furthermore, there was plenty of time for continued discussions and networking as well as gaining impressions of the beautiful surroundings during the excursion. The Spotlights-session was scheduled after the field trip. Spotlights are a new format with a maximum of 5 minutes of presentation which is followed by an in depth discussion of 10 minutes or more. This gives young researchers the opportunity to present their work in progress, unsolved problems or issues they face during their research. After dinner, the evening ended with the continuation of the poster session. On Sunday, the program started with two sessions of oral presentations on “Hard rocks and hard wood” and “Soil erosion, human impact and fluvial morphology”. The meeting ended with an evaluation of the conference and an open feedback round after lunch (see feedback). Last years’ feedback included the comments to have more time for scientific presentations and discussions in general. 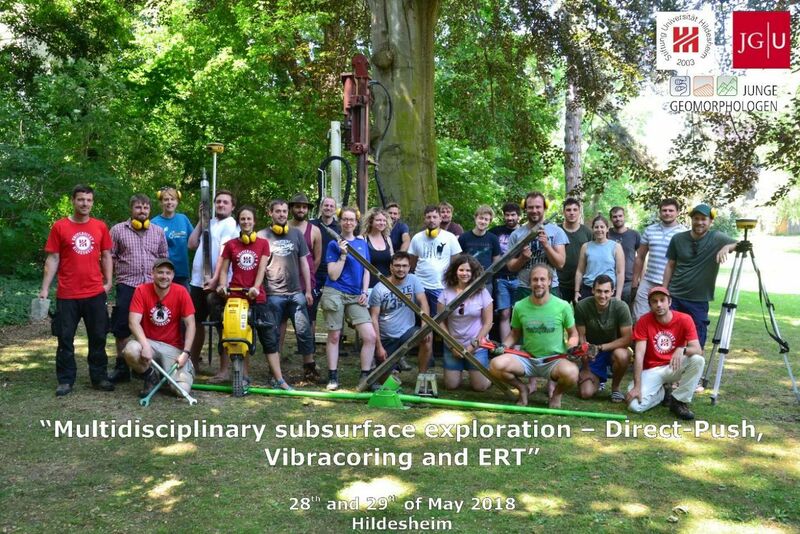 Thus the YG meeting was followed by a two-day YG workshop on “Multidisciplinary subsurface exploration – Direct Push, Vibracoring and ERT” (May 28-29, 2018) organized by Jun.-Prof. André Kirchner (University of Hildesheim), Dr. Peter Fischer (University of Mainz) and their colleagues in Hildesheim. The very interesting and successful workshop had 20 participants and was a great addition to the YG meeting. Overall, the feedback on the meeting was very positive. 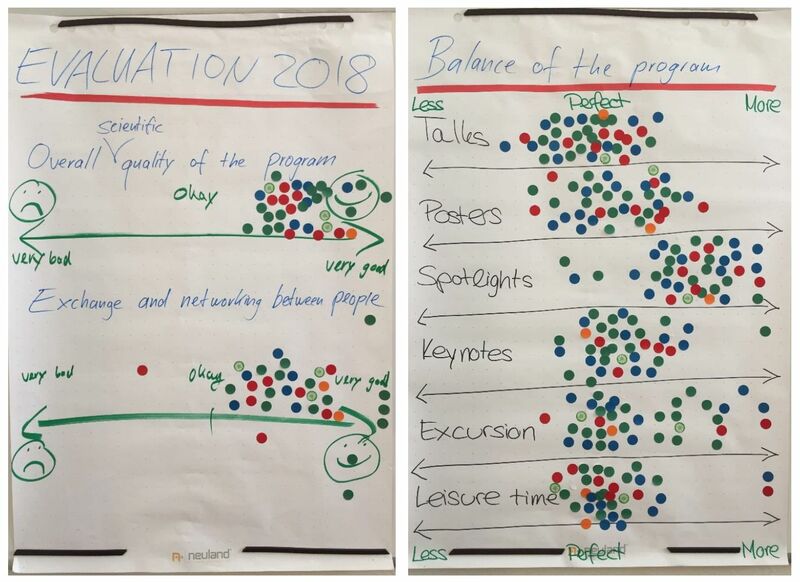 The new session with spotlight was a great success and almost all participants of the workshop would like to have more spotlight-presentations at the next meetings. These sessions put the focus on scientific discussions (min. 10 minutes) instead of the presentations (max. 5 minutes). Other than that, the participants were very satisfied with the balance of the program. 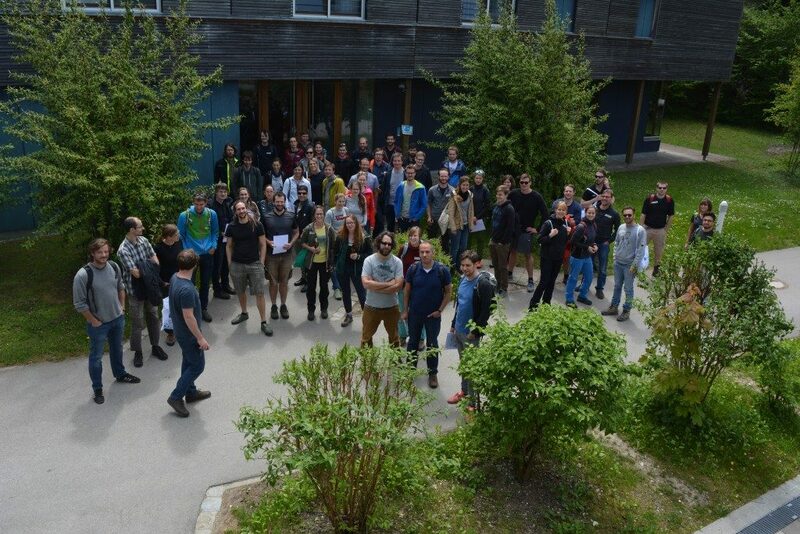 During an open feedback round the participants mentioned the great venue (Waldpädagogikzentrum Weserbergland), the good size of the group (limited to 50 participants), the excursion by foot (no cars needed during the weekend) and the two keynote lectures. The attendees mentioned they would like to have two keynote lecture at all meetings, one on Friday focusing on a general topic (“After Dinner Talk”) and one scientific presentation on Saturday. The group played several games (table tennis, Frisbee, Kan Jam) during the breaks and in the evenings which added to a very positive atmosphere in the group. Concerning new additions to the program it was suggested to have a workshop focusing on scientific discussions in the group (e.g. on the future of geomorphic research or research integrity and ethics). Furthermore, some participants would like to have an additional practical workshop on a certain method during the weekend. However, it is very challenging to fit more items to the already dense agenda and instead of adding an extra day to the program an additional workshop following the meeting was organized at the University of Hildesheim. The YG group is thankful for the financial support of the German Working Group on Geomorphology (AK Geomorphologie) and sponsoring companies (see attached) which makes it possible to run a Young Geomorphologists’ meeting every year affordable for young scientists. We also thank Simon Meyer-Heintze (University of Würzburg) for handling the participant communication. We would like to specially thank Prof. Dr. Andreas Lang and Dr. Peter Fischer for their excellent keynote presentations, Jun.-Prof. André Kirchner for guiding the great excursion, as well as Jun.-Prof. André Kirchner and Jasmin Karaschewski for organizing this great meeting in Stadtoldendorf. Andrea Junge, Raphael Steup and Tilmann Wolpert (University of Gießen) will organize the 13th international meeting of the German Young Geomorphologists group. It will take place near Gießen/Marburg from May 17-19, 2019. The three chairpersons and a support team of six young geomorphologists who were elected in 2017 will organize the activities of the YG in the upcoming year. The members of the team are Johannes Buckel (University of Salzburg), Christian Halla (University of Bonn), Jasmin Karaschewski (University of Hildesheim), Julia Meister (FU Berlin), Simon Meyer-Heintze (University of Würzburg), Anna Schoch (University of Bonn), Anne Schuchardt (University of Halle), Philipp Schulte (University of Aachen), and Anne Voigtländer (Technical University of Munich/GFZ). 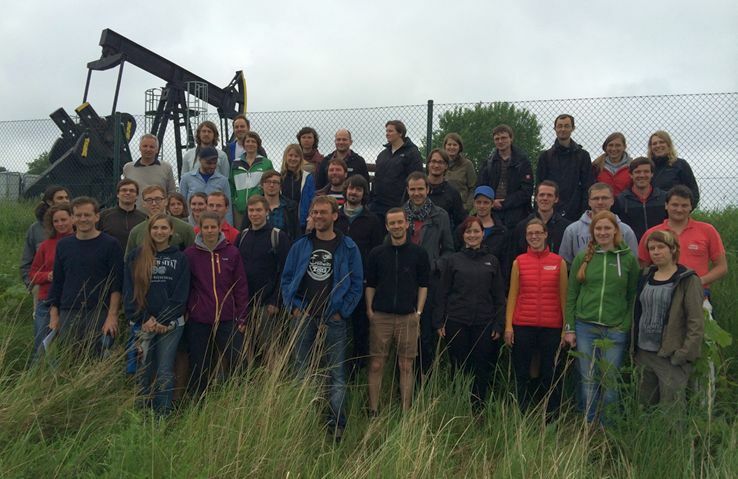 The German Young Geomorphologists (YG) conducted the 11th International Young Geomorphologists’ Workshop at the Ammersee from May 19-21, 2017. 57 German and international guests from Austria, Italy, Poland, and Switzerland gathered close to Herrsching for a three-day workshop. The list of attendees comprised undergraduate, graduate and PhD students as well as postdocs from 21 different universities and institutions. The focus was to present and discuss own research and general geomorphological topics in a rather informal and friendly environment. The program started with a short introduction of the group of Young Geomorphologists and the participants shortly introduced themselves. The attendees could continue the get to know each other during dinner. Then the first session of oral presentations on „Landslides and Loess“ took place. Afterwards, the persons responsible for the individual posters were asked to advertise their work with one slide in a limited time of 30 seconds (for further details on the broad selection of topics see the program). This was followed by the actual poster session, which was open ended, so that discussion kept on going far into the night. Saturday began with the keynote presentation of Dr. Wolfgang Schwanghart (University of Potsdam) entitled “Models, parameters, and the unknown unknowns – issues in Landscape Evolution Modelling”. After lunch, Prof. Dr. Michael Krautblatter (Technical University of Munich) gave a short introduction into the glacially formed landscape of the surrounding of the Ammersee. He then led an excursion to the monastery of Andechs, where the participants could observe the geomorphological forms (drumlins, moraine ridges, etc.) which were left by the Wurmian glaciation in the field. The trip also provided the opportunity for further discussion and networking. 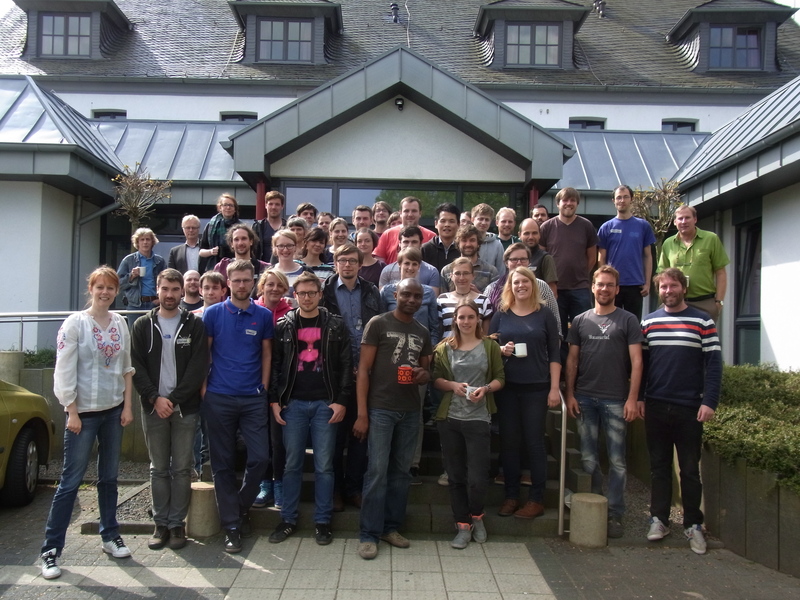 One key aspect of the following general assembly of the German Young Geomorphologists was the election (held every two years) of the chairpersons and a support team of further young scientists. The evening ended with the continuation of the successful poster session. On Sunday the program started with a change in the agenda. The first topic “Q&A 10 years later – open discussion with the “older” Young Geomorphologists” were convened by the organizing team of the YG. There was an open discussion where the young scientists could ask former founders and speakers of the YG (Dr. Sabine Kraushaar, Prof. Michael Krautblatter, Dr. Wolfgang Schwanghart) as well as a regular participant of the annual meetings and long-time support team member (Dr. David Morche) about their intentions on founding the group, the development of the group and perspectives on science. Important topics were early career planning, family (planning) and the increasing demands made on (young) scientists. The second part of the last meeting-day was the Session II: “(High) Mountain geomorphology” featuring oral talks by five participants. 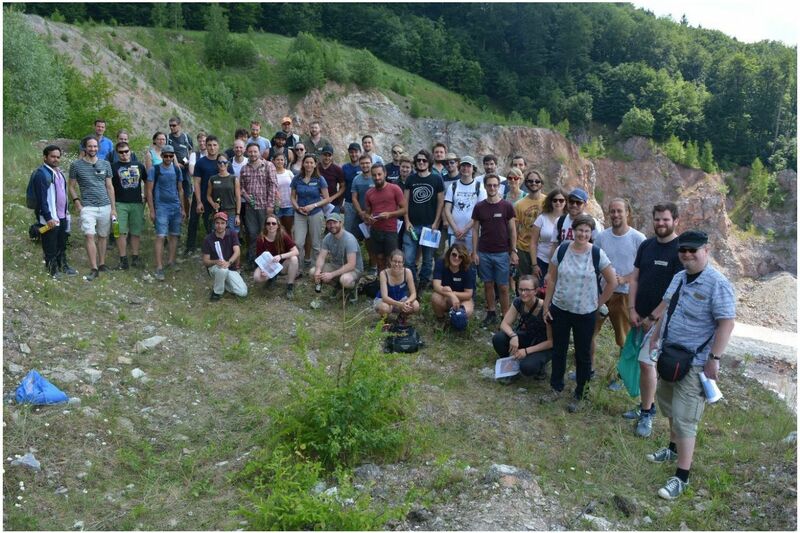 The 10th International Young Geomorphologists’ Workshop, organized by the German Young Geomorphologists (YG) was held from May 27-29, 2015 in Werbellinsee, northeast of Berlin. It was the third time after 2014 that international participants were explicitly invited. In total, 45 undergraduate, graduate, PhD students, and postdocs from 17 different Institutions and Universities (and 3 countries, including , Austria and Germany) came together for a three-day workshop to discuss their own research, as well as topics of geomorphologic interest in general, in a rather informal environment. After a casual introduction of the participants this year’s program started in the evening (19:30 – 21:30) with a Keynote lecture on “The Geophysics and Geochemistry of Geomorphology: why surface processes matter in the big picture, and how we use scary tools to learn about them”, presented by Prof. Niels Hovius (GFZ Potsdam). Following this and a “Late-Night” poster session (22:00 – 23:30) with accompanying 30 seconds introductory talks from all presenters (see attached program for further details). Even though it was already late at night, the poster session was a great success and participants kept on discussing until midnight. On Saturday the workshop started with a session on “Sediment – Surface – Erosion”, featuring 5 oral talks by participants between 09:00 and 11:00, before the group left for a short field-trip to the surroundings of Werbellinsee. The field trip was organized by Dr. Knut Kaiser (GFZ Potsdam), who introduced the group to the postglacial landscape features of the region. Returning from the field trip, the data acquisition for the workshop on on Unmanned Aerial Vehicles (UAV) was accomplished at the lake side, where we also took the opportunity of taking nice group pictures. In the evening, the second poster session with accompanying 30 seconds introductory talks was held (see attached program for further details). Here, we took advantage of the nice weather conditions and held an outdoor poster session, which proved to be highly recommendable for future events. On Sunday morning the second session on “Transport – Interactions” was held, featuring two oral presentations. Following the oral block, Dr. Kristen Cook (GFZ Potsdam) gave a hands-on workshop on UAV data processing and Structure from Motion analysis, using the data collected at the lake shore on Saturday night. 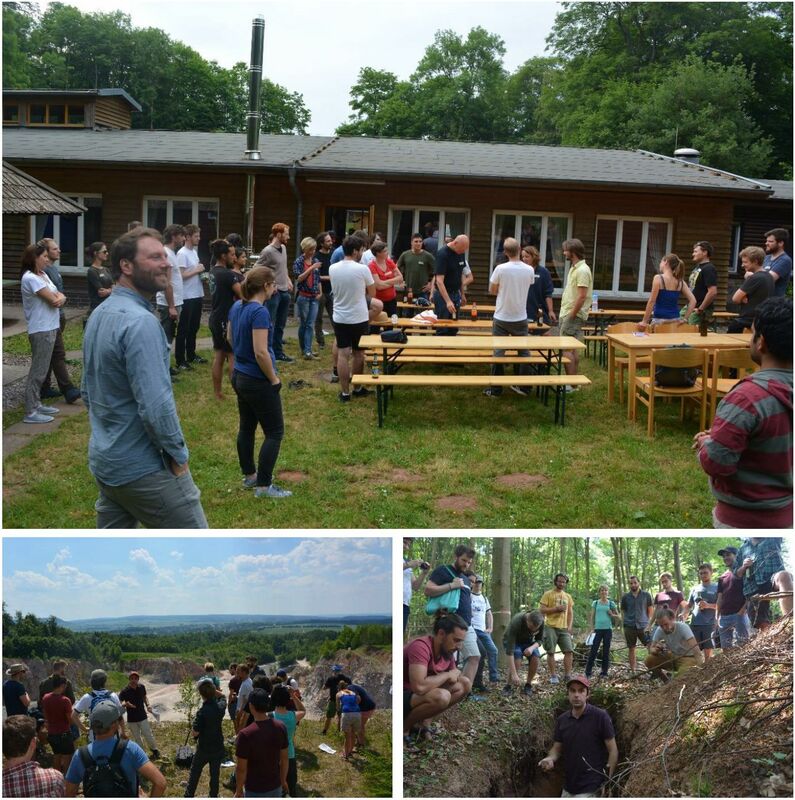 The 9th annual meeting of the German Young Geomorphologists (YG) was held from the 8th until the 10th of May 2015 in Heimbach-Hergarten in the vicinity of the Eifel Nationalpark, southeast of Aachen. It was the second time after 2014 that international participants were explicitly invited. In total, 41 undergraduate, graduate, PhD students, and postdocs from 16 different Institutions and Universities (and 5 countries, including UK, Australia, Belgium, Austria and Germany) came together for a three-day workshop to discuss their own research, as well as topics of geomorphologic interest in general, in a rather informal environment.After a casual introduction of the participants this year’s program started with a “Late-Night” poster session and accompanying 3 min. introductionary talks from all presenters (see attached program for further details). On Saturday morning, Prof. Sean Willet from ETH Zurich gave a “Wake-up lecture” entitled “River network response to tectonic forcing” which was followed by a Keynote talk given by Prof. Frank Lehmkuhl from RWTH Aachen about “Geomorphology: Processes and landscape evolution for geoecology, hydrology and geoarcheology. Examples from the Eifel Mountains towards the lower Rhine Embayment, Western Germany”. A field trip to the surroundings of Heimbach-Hergarten was organized and held by Prof. Wolfgang Römer from RWTH Aachen. The fieldtrip focused on the geologic architecture of the Eifel orogeny and geomorphologic imprints of Cenozoic tectonics including middle Pleistocene terraces and meander cutoff development The program for the next two days included 11 work-in-progress reports as well as reports from advanced PhD-projects which were organized in three sessions (see attached report for details). 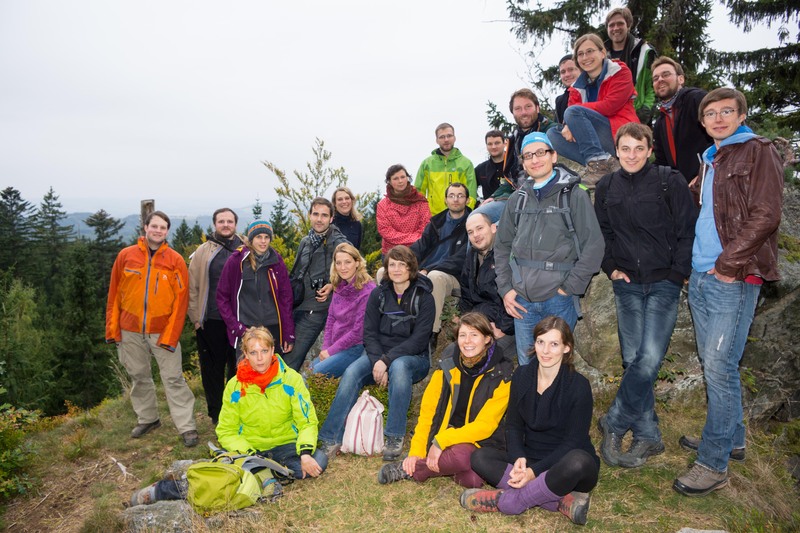 The 7th annual meeting of the German Young Geomorpholgists group (YG) was held in Fleckl (Warmensteinach, Fichtel Mountains, Bavaria). This year, 24 Undergrads, PhD Students, and PostDocs from 13 different Institutions/Universities gathered for three days to discuss their own research, as well as topics of geomorphic interest in general, in a rather informal environment. In addition to the presentations and discussions indoor, a hands-on workshop on the use of terrestrial laser scanning (TLS) in geomorphology was held, where participants could familiarize with the methodology and equipment of this approach, and discuss geomorphological applications. An afternoon field trip was organized on Saturday, during which geomorphological aspects of the Fichtel Mountains, their land-use and mining history were introduced by Mathias Will (Uni Exeter). Das sechste Arbeitstreffen der Jungen Geomorphologen fand 2012 in Aicha (Eichstätt) statt. Eine Vorexkursion (geleitet von Peter Fischer, Eichstätt) führte in den Donau-Auwald. Das Arbeitstreffen thematisierte mit Keynote-Vorträgen Landscape Evolution Modelling (Wolfgang Schwanghart, Potsdam) und Robuste Auswertung multivariater Daten (Elisabeth Dietze, Potsdam). Die Fachvortragsblöcke umrissen die Themen „Sedimentflüsse und Landschaftsdynamik“ sowie „Angewandte Geomorphologie“. Drei Workshops, u.a. von Stuart Lane (Lausanne) zum Thema „Authorship as a young geomorphologist“ (pdf), füllten die drei Tage des Arbeitstreffens reichhaltig. Die bisherigen Sprecher, Sabine Kraushaar (Leipzig) und Michael Dietze (Dresden), wurden bestätigt. Das fünfte Arbeitstreffen der Jungen Geomorphologen fand 2011 in Freienorla (Jena) statt. Entsprechend der Thematik der AK-Tagung behandelten die Keynote-Vorträge periglaziale Hangsedimente und den Wert von Böden und Sedimenten als Umweltarchiv. Ein weiterer Keynote-vortrag behandelte die Wissenschaftsförderung in Deutschland. Die Wanderung führte durch den Thüringischen Muschelkalk und Buntsandstein. Als neue Sprecher wurden Sabine Kraushaar und Michael Dietze gewählt. Das vierte Arbeitstreffen der Jungen Geomorphologen fand 2010 in Wilhelmsaue (Oderbruch) statt. Keynote-Vorträge und Diskussionen u.a. zu Forschungsanträgen und Förderungsmöglichkeiten bildeten den fachlichen Kern. Die Wanderung führte durch die Brandenburger Jungmoränenlandschaft. Die bisherigen Sprecher, Michael Krautblatter und Wolfgang Schwanghart, wurden bestätigt. Das dritte Arbeitstreffen der Jungen Geomorphologen fand 2009 in Herrischried (Südschwarzwald) statt. Die projektbezogenen Vorträge waren meist Werkstattberichte und ermöglichten methodische und inhaltliche Diskussionen. Der Themenschwerpunkt des Treffens hatte den Titel: Alleskönner Geomorphologen? Beiträge der Geomorphologie zu interdisziplinärer Forschung. Außerdem wurden übergeordnete Diskussionsrunden eingerichtet. Als neue Sprecher wurden Michael Krautblatter und Wolfgang Schwanghart gewählt. Das zweite Arbeitstreffen der Jungen Geomorphologen fand 2008 in Schwrizheim (Eifel) statt. Neben den projektbezogenen Vorträgen stand die Theorie Komplexer Systeme im Fokus und inwiefern sich diese Ansätze als wissenschaftstheoretischer Rahmen in wissenschaftliche Arbeiten integrieren lassen kann. Während des Treffens wurde das aktuelle Logo und der Name selbst entwickelt. Thomas Hoffmann als kommissarischer Sprecher der Jungen Geomorphologen gewählt. Die Wanderung unter Führung von Manuel Seeger führte zum Meerfelder Maar. Das erste Arbeitstreffen der Jungen Geomorphologen fand 2007 in Wartaweil (Ammersee, Bayern) statt.